The AC adapter, AC/DC adapter or AC/DC converter is a type of external power supply, often enclosed in a case similar to an AC plug. Other names include plug pack, plug-in adapter, adapter block, domestic mains adapter, line power adapter, wall wart, orpower adapter; adapters for battery-powered equipment may be described as chargers. AC adapters are used with electrical devices that require power but do not contain internal components to derive the required voltage and power from mains power. The internal circuitry of an external power supply is very similar to the design that would be used for a built-in or internal supply. It works on the principle of SMPS technique. A switched-mode power supply (switching-mode power supply, SMPS, orswitcher) is an electronic power supply that incorporates a switching regulator toconvert electrical power efficiently. Like other power supplies, an SMPS transfers power from a source, like mains power, to a load,such as a personal computer, while converting voltage and current characteristics. Unlike a linear power supply, the pass transistor of a switching-mode supply continually switches between low-dissipation, full-on and full-off states, and spends very little time in the high dissipation transitions, which minimizes wasted energy. Ideally, a switched-mode power supply dissipates no power. Voltage regulation is achieved by varying the ratio of on-to-off time. In contrast, a linear power supply regulates the output voltage by continually dissipating power in the pass transistor. This higher power conversion efficiency is an important advantage of a switched-mode power supply. Switched-mode power supplies may also be substantially smaller and lighter than a linear supply due to the smaller transformer size and weight. Originally, most AC/DC adapters were linear power supplies, containing a transformer to convert the mains electricity voltage to a lower voltage, a rectifier to convert it to pulsating DC, and a filter to smooth the pulsating waveform to DC, with residual ripple variations small enough to leave the powered device unaffected. Size and weight of the device was largely determined by the transformer, which in turn was determined by the power output and mains frequency. 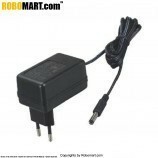 NOTE:This adapter is a AC to DC converter which gives us the output voltage of 9V and current of 1A.